Lovely stay - We stayed in The Coach House for two nights as we were attending a family wedding. It's lovely and warm and clean. Chris and Alison are very welcoming and nothing is too much trouble. The breakfast was lovely. Very many thanks again to you and to Alison, for making the family gathering possible for us. We could not have been better welcomed, accommodated and breakfasted! All loved the whole experience offered by Mellington House. Just wonderful! The B&B/self-catering combination was perfect. All enjoyed your magnificent garden too. Thank you for allowing us to play/ relax there. Please may we keep you at the very top of our list of places to stay for any future return to my home party of the world? What a superb B & B. We were greeted with a lovely of cup tea and biscuits when we arrived. The hosts Chris and Alison were friendly and helpful. We stayed in The Old Stable. It was clean, comfortable and spacious. At breakfast there was large selection of cereals, fruit and yogurt. The cooked breakfast was tasty, plentiful and beautifully cooked. We shall certainly be returning. Warmly welcomed after a last minute booking. Quaint, cute village. Mellington House B&B is a beautiful building with lots of character. We stayed in the coach house adjacent to the main house. The coach house has the most perfect view out over the large garden and is peaceful, private and excellently equipped. We finished or stay with a delicious freshly cooked breakfast. Thank you for the plums ! We have been regularly staying at Mellington House for several years now. Chris and Alison make all their guests feel very much at home in their cosy accommodation. Nowhere will you receive a warmer welcome or a more tasty, well cooked breakfast. We are so fortunate to be able to stay in their picturesque home. We've both enjoyed so much our stay in your lovely cottage and for your very warm welcome. I'm sure we will be back. I stayed at Mellington House in self catering accommodation for just one night and I could not have been happier. Clean and comfortable I had everything I needed whilst I visited the area for the Hay Festival. Although I only stayed for one night it felt like a mini holiday - and Weobley is a delightful place. Next time I would definitely stay longer. Spent a night here after visiting the area. Was pleasantly surprised that our accommodation comprised of a stand alone coach house. We had a kitchen lounge and bathroom on ground floor and a bedroom upstairs. The unit was clean comfortable and warm. The following morning we returned to the main house ( just across the courtyard) to enjoy a hearty breakfast cooked by Chris and served by Alison (both so friendly and welcoming). After cereal, fruit juice, fresh fruit, a full English breakfast with tea and toast, we could barely move to go and pack our bags. Next time we're back down in the Hereford area, we will certainly be checking in at Mellington House. Thank you both for making our stay so comfortable. Just returned from our fourth stay in the Hayloft at Mellington House. There are two bedrooms in this accommodation; a double bed in one and two singles in the other. There is also a lounge and a kitchen/diner area. The accommodation is available for either self-catering or bed and breakfast. We always stay on the latter basis and find the owners very friendly and helpful. There is always a large choice of cereals and a good selection for the cooked breakfast. 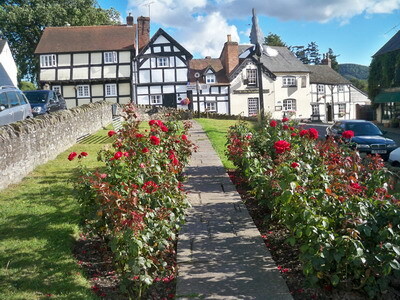 Weobley is a very nice village, as was seen when it appeared on BBC1's 'One Show' in August. It is a very good base for enjoying a very pleasant part of the country. Beautiful family run Bed & Breakfast apartments , Fantastic service very friendly and a lovely big English Breakfast. Village is lovely and lots to see and do. The rooms we booked had a kitchen and sitting room and nice sized bedrooms. Parking is very easy out the front of the house. This was certainly the best B&B I have ever stayed in. The rooms are superb, they have everything you could possibly hope for and more. My husband and I stayed in the Old Stable which is on the ground floor, and as my husband cannot deal with stairs this was ideal. To have a kitchen was a real bonus. Our friends stayed in The Hayloft which was a fantastic family room. Every where was decorated to a very high standard and spotlessly clean. Chris and Alison could not have been more welcoming and the breakfast was excellent. The village of Weobley is well worth a visit with all the lovely black and white buildings. It also offers good local food in the Salutation Pub and at very good prices. We will certainly be back. Thank you on behalf of my husband and our friends for a lovely stay. So pleased David found you on the website. He could not have found us a more beautiful place to stay. I have posted a review on your website but I am sure that you must get a lot of repeat business. Hopefully we will be back again soon. Once again thank you for your hospitality. We found this excellent B and B by attending a family wedding nearby. It was recommended by the wedding venue as well as the Bride and Groom. We booked The Coach House in the garden which was excellent. ...fully equipped kitchen.....lovely lounge looking out onto the beautiful garden and shower room downstairs. Quaint narrow stairs to bedroom upstairs. Excellent breakfast in the main house with Chris and Alison who were perfect hosts. Nothing was too much trouble. Excellent 4 day stay. We'll be back next year!! We could not have asked for more at this lovely B&B. My husband and I used the Annex and felt so at home while our grown up children stayed in the cottage. We had all the facilities of self catering accommodation with the added benefit of having the owners on hand............ We are looking forward to returning. Thank you so much for yet another lovely stay in Weobley................ we love it and go home refreshed, looking forward to next year. Thank you for such a lovely stay in Weobley, we all had such a good time. Many Thanks for another comfortable stay. Alison and Chris offer a fabulous place is stay - the choice of B and B or self catering gives the best of both worlds. The Coach House was warm and extremely comfortable. Everything was spotlessly clean and well organised. I couldn't recommend this accommodation highly enough. Breakfast was superb too. Thank you so much for your hospitality. We loved The Coach House and will be sure to return. Thank you again. Thank you for yet another wonderful Weobley break - We are going home refreshed and relaxed - Thank you so much. We'd love to come back and stay again, its just perfect. .... And thanks for a very comfortable stay. Only sorry it was so brief. And I forgot to say...those mushrooms were delicious this morning! Helpful and friendly hosts at this superb B&B which can also be self catering units. Lovely garden and secure parking in the centre of a famous 'black & white' village, which has been voted one of the best places to live in England. Coffee shop/deli next door, Post Office & shop directly opposite, excellent restaurants and pubs within 200 yds. The accommodation is well maintained and heated, has free Wifi and Sky TV and the excellent breakfast includes their own free range eggs. The house is over 400 yrs old with half timbered construction and a Queen Anne front. Weobley oozes history and this central venue exceeded our expectations. We have stayed here about 5 times now while visiting family in area. Chris and Alison are very welcoming and make you feel at home. We usually stay in the Hayloft which is an exceptionally well furnished 2 bed unit, with lots of little touches to make it very comfortable and a touch above most b & b's. The whole premises are spotlessly clean, well maintained and with attractive decor. Beds comfortable and excellent toilet facilities. We could not have asked for more at this lovely B&B. My husband and I used the Annex and felt so at home while our grown up children stayed in the cottage. We had all the facilities of self catering accommodation with the added benefit of having the owners on hand. The breakfast was wonderful, cooked fresh and our children who couldn't make it to breakfast early, bacon sandwiches were sent up to the cottage. It was a wonderful stay, we were allowed a late check out of 12 noon. We are looking forward to returning. Just to say an enormous thank you to you both for the wonderful accommodation and sustaining breakfasts you provided. Thank you so very much! The Hayloft was a haven! A very comfortable stay. Thank you very much. Nice easy trip home. Many thanks for your hospitality -- we had a very good time, & will hope to visit again before too long. ... to say "Thank you for having us and to say how much we enjoyed staying at Mellington House"
My husband and I stayed 2 nights in the Annexe at Mellington House in Weobley. We have stayed in many places around the world but have never received such a warm welcome as we did from Chris and Alison at Mellington House. They are such warm and wonderful people. The accommodation was large with our own bathroom, kitchen, bedroom and comfy 'snug' tv room. The whole place was very clean and the décor delightful. The beds were really comfy. The 'snug' is an added bonus and made the accommodation feel like a home from home. Nothing was too much trouble for Chris and Alison which was very much appreciated as we had come to Herefordshire to look for property to rent before my retirement and I am on crutches awaiting a hip replacement. We arrived late afternoon and was immediately offered a cup of tea in the main house which was accompanied by a wonderful home made cup cake. Truly over and above. The breakfast was plentiful and of local produce. We would have no hesitation of recommending Mellington House to anyone. 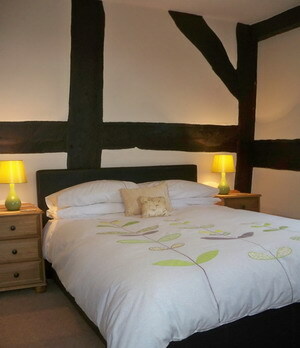 Thank you so much for yet another lovely stay in The Hayloft. It has truly been one of our best visits - really relaxing and just great. I just wanted to say thank you very much for our delightful stay at Mellington House. We felt warmly welcomed from the start. The rooms were lovely and we were really impressed at having our own kitchens and sitting rooms. It was very kind of you to let us use your garden on Saturday morning (and well beyond the call of duty) – we found it wonderfully relaxing to be able to sit and chat while the children played badminton. We also felt that you were super-child-friendly, providing late-night cereal as well as Calpol when required. Thanks for a lovely stay in The Hayloft, we had a wonderful time! We had a lovely time at the cottage and my brother enjoyed his stay as well. Brilliant Accommodation. We stayed here again with our sister in law for a funeral. The accommodation was made available for us to change our clothes prior to the funeral, which was very helpful. As before we were made very welcome and were pleased to note that the high standards had been maintained. We would wholeheartedly recommend this as excellent value for money, facilities and welcome. No fault found. Will definitely stay here again. "We had such a lovely stay at Mellington House and would highly recommend this as a great place to stay. Friendly, clean, beautiful surroundings, we couldn't have asked for more!" "Just to say thank you for a warm welcome to Weobley Mon / Tues. It was a first time visit to Herefordshire for Henry amd he was totally blown away with the whole 2 days. Shame he didn't let me win at golf! We both thought that the Hayloft was terriffc and we thank you for allowing us to stay there for just one night. We will be back again for longer and we will bring the ladies along also. Thanks again." "Thank you for a nice comfortable time. I was working very hard on Kings Pyon war memorial and getting back to comfort every evening in such chilly weather was just the ticket." "We had a lovely week with you in May and wondered if you could pencil us in for the same week next year." "Thanks for putting up with us for the three weekends - unfortunately it is our last visit as a walking group. I am sure however you will be seeing us as individuals at some time in the future." "Thank you for a wonderful 2 days in your B&B"
"We enjoyed our visit very much and look forward to coming again in the not too distant future"
"Many thanks for all your hard work to make our stay so enjoyable." 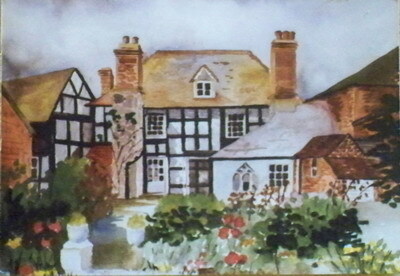 "We really enjoyed being back in Weobley & are pleased that it won't be so long before we return. Many thanks, once again, for your hospitality." Homely welcoming accommodating, as it were, complete! Stress-busting, tranquil, relaxing, what a pleasant release!